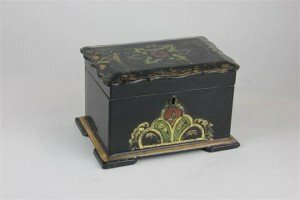 A 19th century black lacquered tea caddy, the scalloped lid with gilt embellishment opening to reveal two galvanised wells with covers. 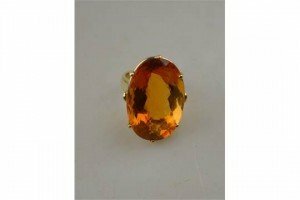 A large cocktail ring set with oval multi-faceted citrine above and below girdle, in handmade yellow metal basket style setting stamped 14k. 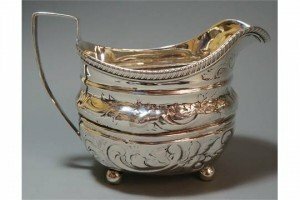 A George III silver milk jug, with floral foliate detailing to the body, with a gadrooned rim on bun feet, London 1806. 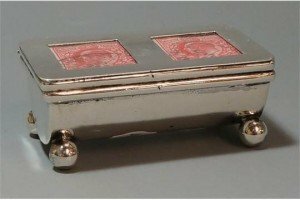 A silver rectangular shaped stamp case, with two franked red penny stamps to the top within glass windows, raised on ball feet. 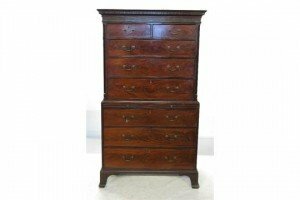 Birmingham 1900. 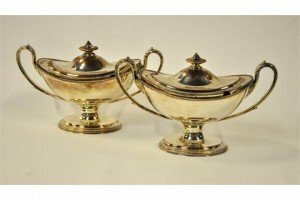 A pair of Adam style Old Sheffield Plate sauce tureens and covers with twin handles, on stemmed bases with gadrooned rims. 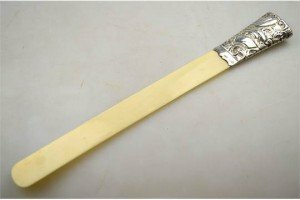 A late Victorian page turner with ivory blade and foliate-embossed silver handle, William War, Birmingham 1895. 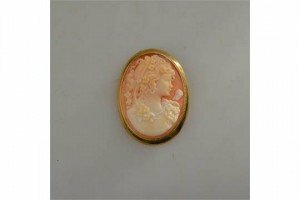 An oval shell cameo of Diana with pendant fitting attached, yellow metal setting with rope edge. 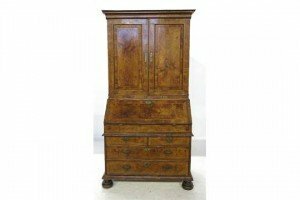 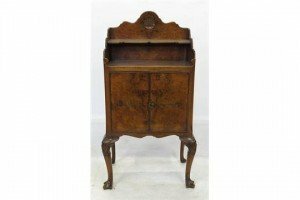 An early 18th century walnut bureau bookcase, fitted two blind fielded panel doors opening to reveal shelves, fitted two candle slides below, the feather banded fall flap revealing a fitted interior and well, with two short and two long drawers below. 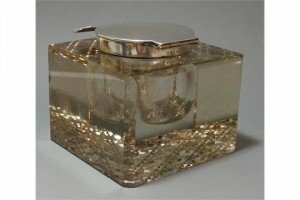 A large glass inkwell with silver hinged lid and collar, hobnail cut glass design to base, marked Birmingham 1911. 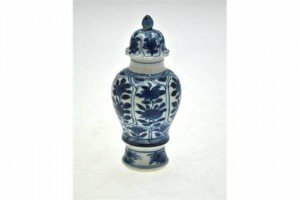 A Chinese blue and white small vase decorated with six panels of flowers and foliage to an associated cover decorated with five panels of flowers and foliage. 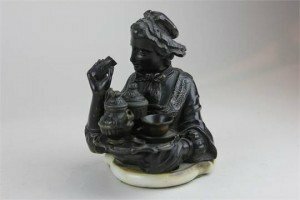 A 19th century bronze desk stand modelled as a lady with tea tray, her head hinged to reveal inkwell, her arm a seal, with quill or pen holder on white onyx base. 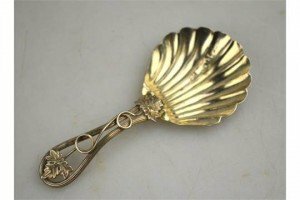 A Victorian silver caddy spoon with shell bowl and open-work vine handle. 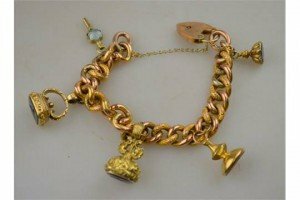 A yellow gold hollow curb linked bracelet, having three-intaglio seals attached including stone set and blue enamelled watch key, one jasper, one amethyst, one bloodstone and one small uncut amethyst seal. 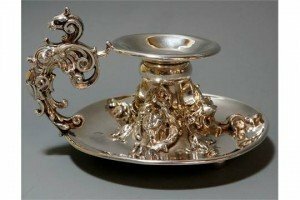 An American Art Nouveau silver candlestick, scrolling foliate handle with roaring lion’s head uppermost, three ladies head’s with tiaras and flowing hair to drip pan, ball feet, marked sterling. 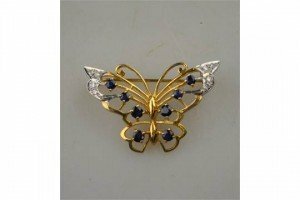 An open work style butterfly brooch, set with sapphires and eight-cut diamonds in yellow and white metal setting. 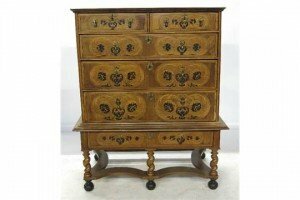 A late 17th century marquetry chest on stand, the upper section fitted with two short drawers over three long graduated drawers, over a further drawer to the base, raised on spirally turned legs united by wavy stretchers, the top, front and sides with ornate marquetry inlay. 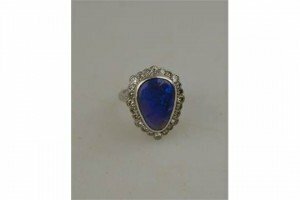 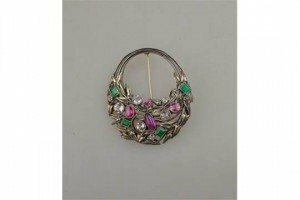 A pear shaped black opal cabochon and diamond cluster ring, white metal set stamped 18ct.